You will always speak with the owner, Bjarki or the operations manager, Nate. We love to talk with our customers about our flooring and your specific project. We can answer any questions you might have about our flooring or how to install it. To start the ordering process, you can request a quote or email us. Also, we can be reached at (207) 587-2145 during our business hours. We look forward to hearing from you! To view our current pricing on our Pine flooring, click here! We understand that when working on a home restoration, renovation, addition or a new build, timeliness is important. We always try to have thousands of square feet in stock so we can ship it to you quickly. Typical lead time is 2-4 weeks, but we can sometimes be as much as 6-8 weeks out during the busy season. We also offer flexible delivery options to accommodate you or your builders busy schedule. 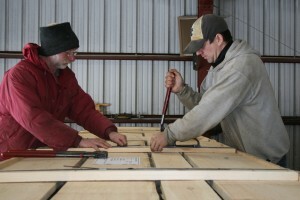 We make each floor to order to keep the planks a dry as possible. We ask that you schedule your delivery for the day you are ready to install the floor so it can be sealed as quickly as possible. Doing so will ensure it is exposed to as little humidity as possible. Prompt installation and finishing will result in the highest quality floor. We ship all over the country using two methods. One option is to ship your floor in an 18 wheeler enclosed delivery truck. When using this method, your floor is wrapped in a water resistant cover to protect it from the elements, and packed in a rugged one inch thick protective wooden crate. Each crate is custom built to snugly fit your order and held together with thick metal banding. The trucking company will call you to schedule a delivery. If a loading dock is not available, you should have at least two or three people available to help unload your floor from inside the truck. If you are considering having a floor shipped, please read our LTL delivery guide. We also offer hand delivery by one of our knowledgeable staff. This can be a nice option if your home is not easily accessible with a large truck, or if you would like help with the unloading. Both options allow for delivery to meet your busy schedule, any day of the week. Of course, you may also pick up your order yourself at our mill in Mercer, Maine.